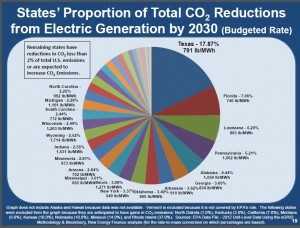 EPA’s Clean Power Plan: Strategy for One-Party Rule? 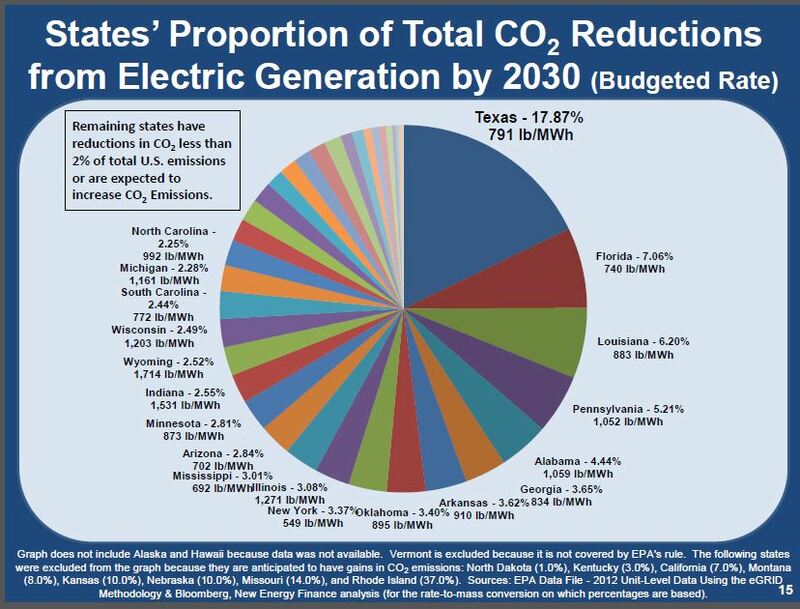 EPA’s Clean Power Plan would compel each state to reduce its power-sector carbon dioxide (CO2) emissions by a specified percentage by 2030. As discussed previously on this blog, the Plan is climatologically irrelevant. According to EPA’s own scientific assumptions, the mandated emission reductions will avert less than two-hundredths of a degree Celsius by 2100 — too small a change for scientists to detect or verify. 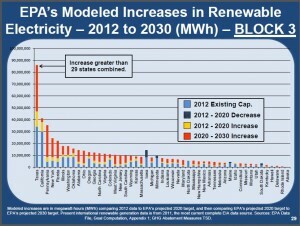 The alleged climate benefits in the policy-relevant future (between now and 2030) would be even more miniscule. So what’s the point — power (centralized control) for power’s sake? Well, sure, regulatory agencies exist to regulate, and ‘progressives’ believe more government is better. However, the Plan has a deeper diabolical cleverness. An eye-opening analysis by Mike Nasi, an attorney with Jackson Walker, reveals that the Clean Power Plan will wreak havoc on the economy of Texas. The Lone Star State is, of course, the Red State economic, energy, and political powerhouse. Whether measured in job creation, GDP growth, cost of living, energy affordability, or population gains/losses due to people voting with their feet, the Texas Model is clobbering the California Model. If your political goal is to replace robust two-party competition with one-party rule, sabotaging Texas is a must. The Clean Power Plan is fundamentally a strategy to do just that. Nasi doesn’t discuss the Plan’s political implications, but that’s what we may reasonably infer from his presentation. Let’s look at some of the slides. First, for background, the Texas electric power sector’s current average emission rate is 1,284 lbs. CO2/MWh. By 2030, existing power plants in Texas must achieve a rate of 791 lbs. CO2/MWh. 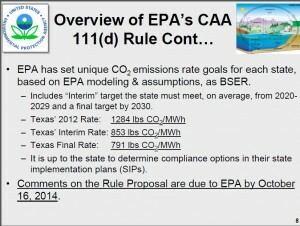 Note: That is lower than both EPA’s proposed “carbon pollution standards” for new coal power plants (1,100 lbs. CO2/MWh) and new natural gas combined cycle (NGCC) power plants (1,000 lbs. CO2/MWh). Everyone knows Texas is the nation’s leading gas & oil producer. 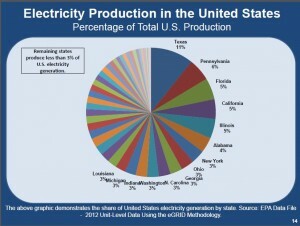 Less well-known is that Texas is also the nation’s leading electricity producer, accounting for 11% of U.S. generation. Although Texas accounts for 11% of U.S. electricity production, the Clean Power Plan requires Texas to achieve a disproportionately large share — 17.8% — of the nation’s CO2 reductions. 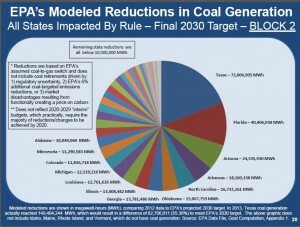 EPA sets statewide CO2-reduction targets based on its modeling of states’ opportunities to use four building block strategies for reducing generation from coal and natural gas. In building block 2, states run NGCC plants at up to 70% capacity to displace coal as a source of base load power. 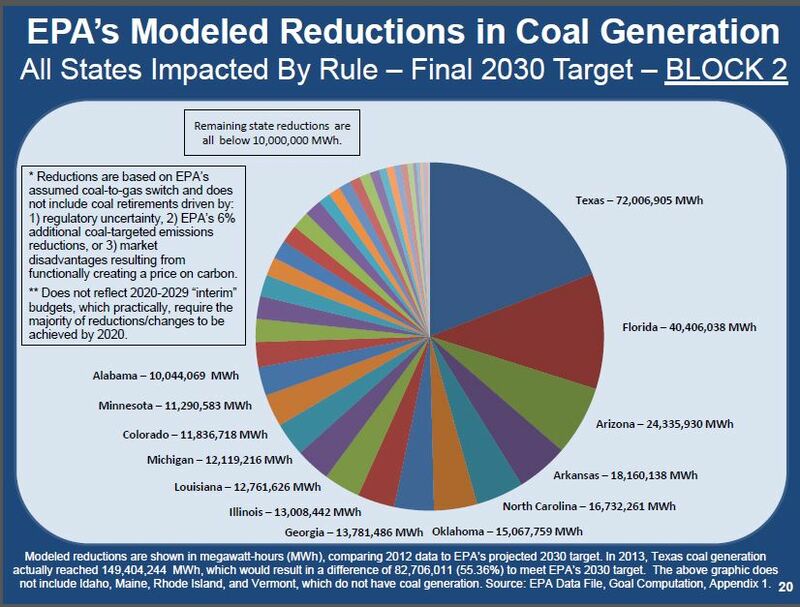 Compared to a 2013 baseline, EPA’s modeling assumes a 55% reduction in Texas coal generation by 2030. 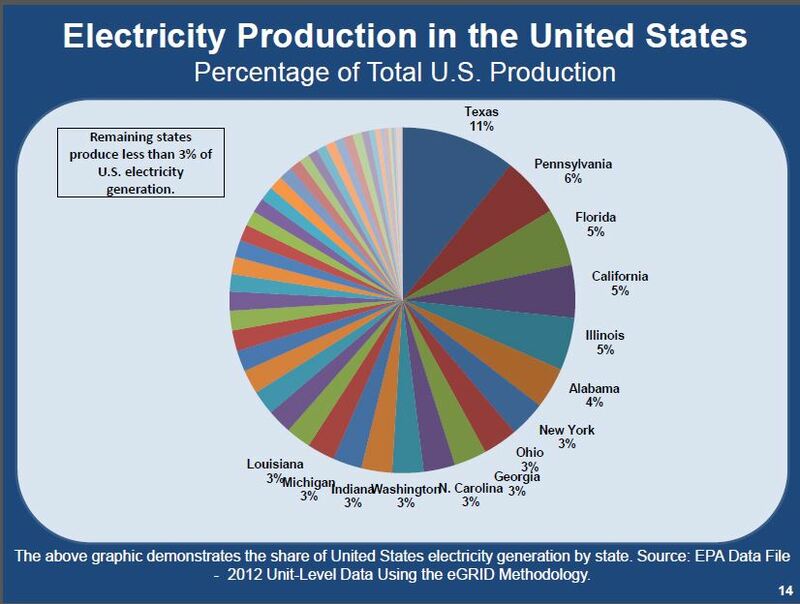 Many states are more reliant on coal for electric power than Texas. 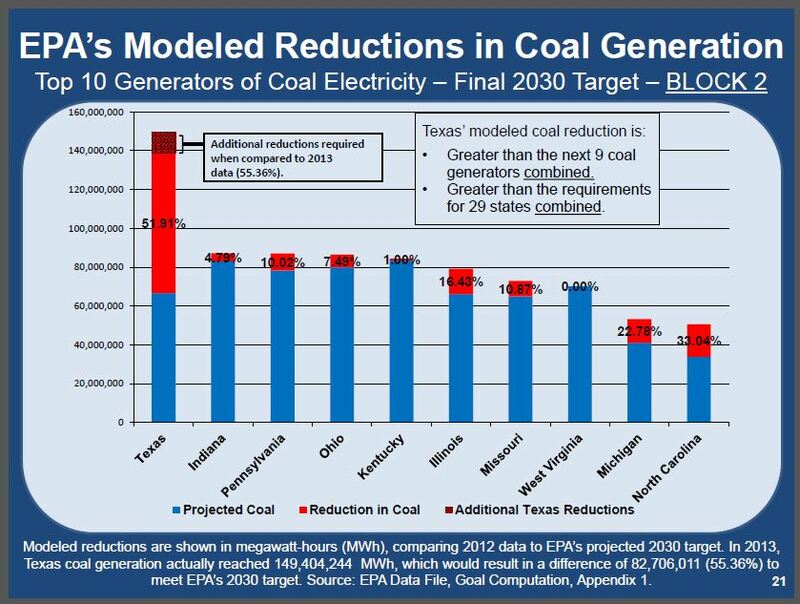 However, in both absolute amounts and percentage terms, the Clean Power Plan requires bigger coal-generation reductions in Texas than any other state with significant coal capacity. 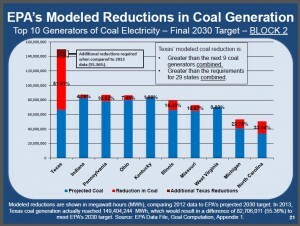 Indeed, EPA’s modeled coal reduction in Texas is larger than those of the next nine largest coal generators combined. 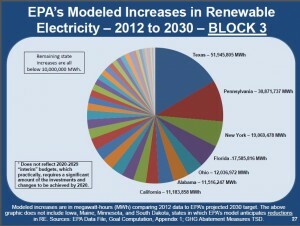 The third “building block” states may use to meet their CO2 reduction targets is to replace coal and gas generation with electricity from renewable sources. Texas already has the dubious distinction of having the most installed wind capacity due to an aggressive renewable electricity mandate and multiple subsidies. 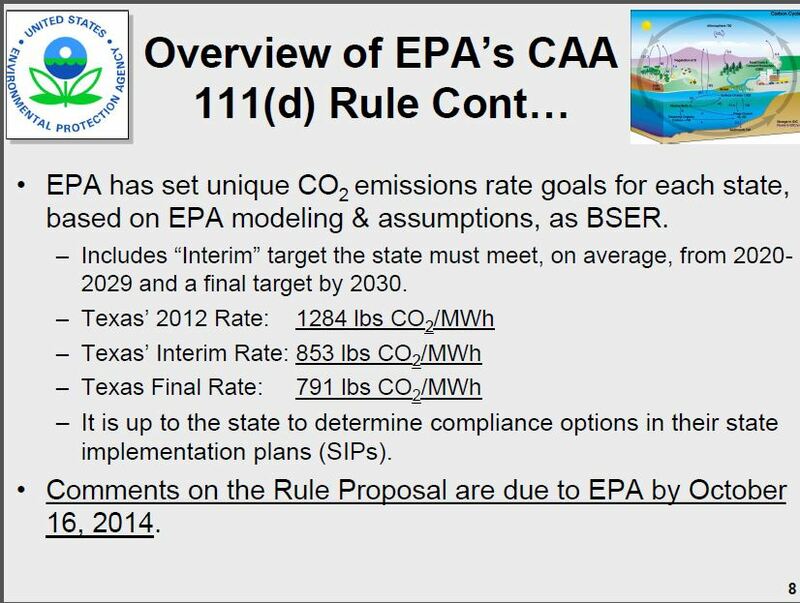 Nonetheless, in setting Texas’s CO2 reduction target, EPA assumes the Lone Star State will increase renewable generation by more than any other state. 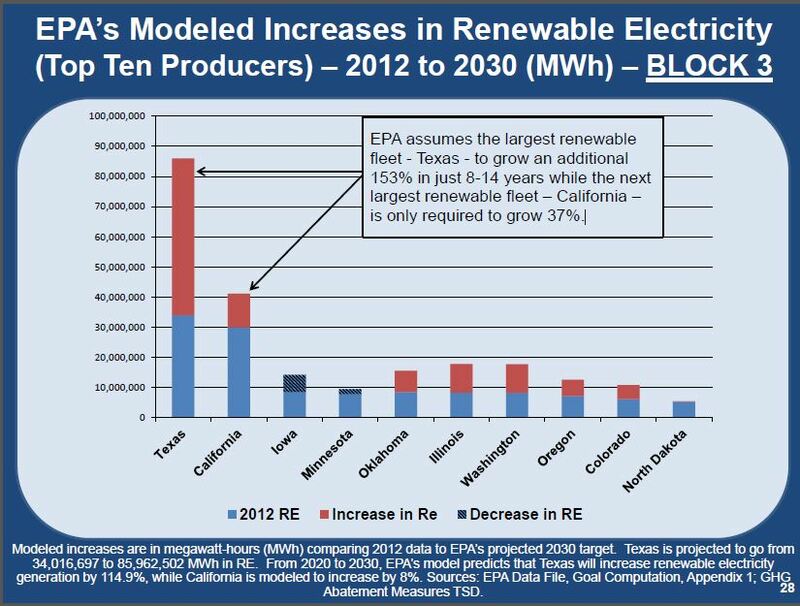 Specifically, EPA assumes the Texas renewable fleet will grow by an additional 153% in just 8-14 years while the next largest renewable fleet — California — only has to grow by 37%. 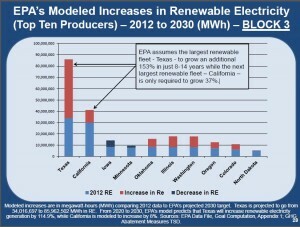 Texas must add more new renewable capacity than other top producers combined. 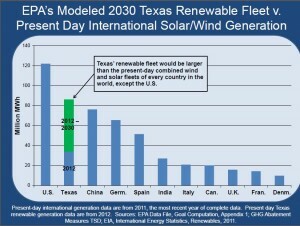 In all, Texas must add more renewable capacity than 29 other states combined. 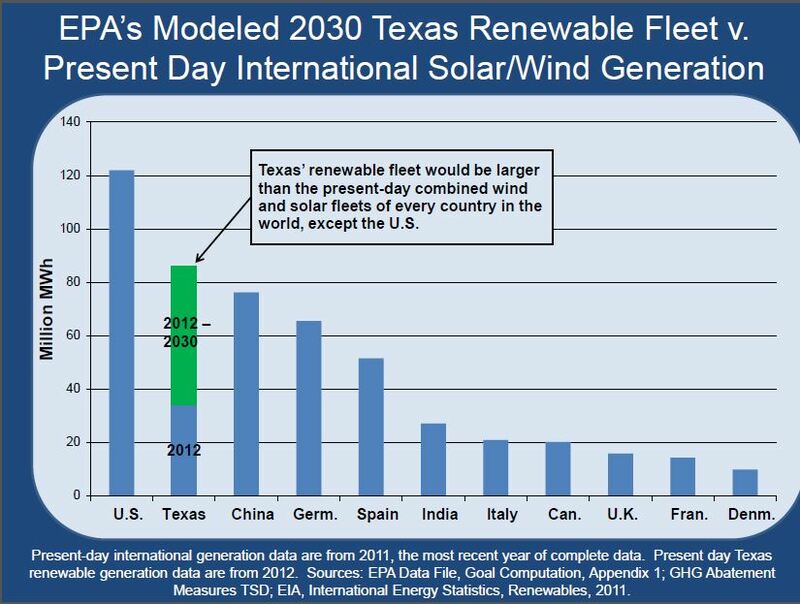 In other words, EPA assumes Texas in 2030 will have more wind and solar capacity than any other nation today except the U.S. 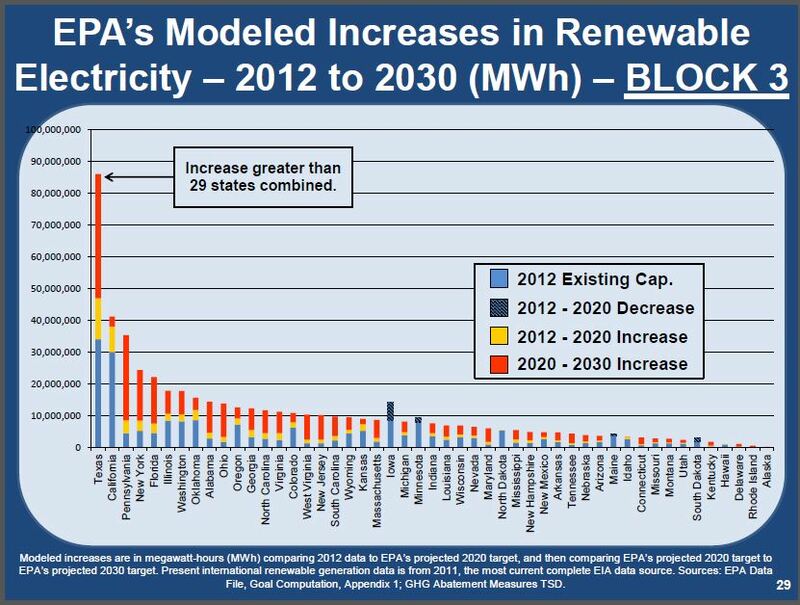 It is hard to contemplate these charts and not see a strategy to impose California/RGGI/European-style energy policy on Texas. As electricity in Texas becomes more costly and less reliable, the state’s energy-intensive industries — manufacturing and mining — would become less competitive, attracting less investment and creating fewer jobs. Previous post: Will eBay Stand with ALEC?